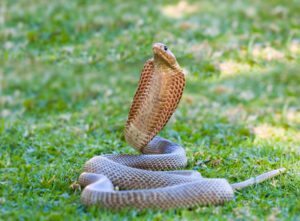 Dog owners are urged to be vigilant about snakes, particularly in the summer months when they are most active. Most dogs don’t understand that snakes can be deadly and will either attack a snake or at the very least try to sniff it or poke their nose down its hole. 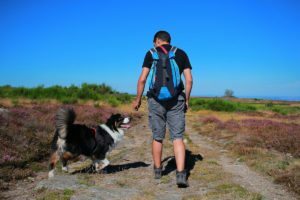 Snakes strike defensively so if you keep your dog on a lead while walking trails or on mountains, and keep a look out, you and your dog should be fine. If bitten, the symptoms and severity of the bite depend on a wide range of factors: non-venomous or a venomous; species; age and size of the dog (and human), and where the bite occurred. (Bites closer to the heart are more serious as the venom will be pumped through the body rapidly.) In dogs, bites occur most often on the limbs or muzzle. Adrenalin speeds up metabolism which causes the venom to spread faster. Keep your dog calm. Try to identify the snake by taking note of its size, shape of the head and colour patterns. Take a photo if possible. Take the necessary precautions to protect yourself and your dog from further harm, including being bitten by a stressed-out dog. Look for fang marks and wrap a clean bandage on the affected limb snugly (but not too tight). This will reduce the amount of venom from entering the bloodstream. Try and keep the affected area lower than the heart and get to the nearest animal (or human) hospital as soon as possible. The hospital will need as much information about the snake as possible. In most cases, anti-venom will need to be given but because anti-venom is specific to each type of venom, it’s important the doctor knows what snake bit your dog. Unfortunately not all animal hospitals will stock anti-venom. If you can, call ahead and if your vet, they can refer you to the nearest animal medical centre who stocks it. Tygerberg Animal Hospital in Bellville (021) 91 911 91 stocks anti-venom. Stay on marked trails and paths, where it’s easier to spot snakes. Don’t let your dog poke his nose in holes or under logs. If your dog is particularly curious, pawing at something, call him (or pull him) away. Rather be safe than sorry! If you spot a snake, stop moving. If you and your dog are standing still, it won’t see you as a threat and will more than likely glide away. If it is cornered, back away slowly, giving it an escape route. Always be vigilant on your walks, especially if you are walking in a snake’s natural habitat. Black Mamba: usually found in the North West, Limpopo, Mpumalanga and Northern KwaZulu-Natal. It can grow up to 4.5m and is one of the fastest snakes, moving at over 20km/hour. The Black Mamba is often olive-coloured to dark brown and has a coffin shaped head. It gets its name from the colour of the inside of its mouth, which is black. It can inject fast-acting neurotoxins which paralyses. Puff Adder: found throughout Southern Africa and considered extremely dangerous because it doesn’t move out of the way. Thick, and heavy bodied, it is seldom over 1m long. The head is large, flattened and triangular. 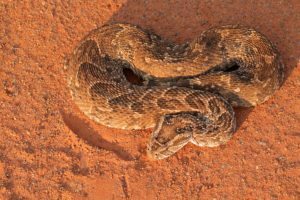 Puff adders vary in colour widely from blackish to brown and have a row of backward pointing dark brown pale edged chevrons along their backs. They also have very long fangs and inject their venom (which is cytotoxic and haemotoxic) deeply. Boomslang: found all over South Africa except the Northern Cape and part of the Free State. They have very large eyes and a characteristic egg-shaped head. They are highly variable in colour with males being light green to black with black or blue scale edges, and adult females brown or green. Usually found in trees or small shrubs. The venom is very slow acting and it can take up to 24 hours for symptoms to appear. Cape Cobra: found in the Cape, Free State and Eastern Cape. It is variable in colour from reddish brown to olive brown, yellowish. It lifts itself off the ground, spreads its hood and makes a hissing sound when ready to strike. Rinkhals: has the ability to shoot venom from its fangs usually aiming for the face and eyes which causes temporary blindness. Found in the Southern Cape, Eastern Cape, Free State and parts of KwaZulu-Natal. Mozambican Spitting Cobra: found in the northern areas of South Africa. Relatively small and thin, it spits its venom between 2-3m, usually aiming for the eyes.